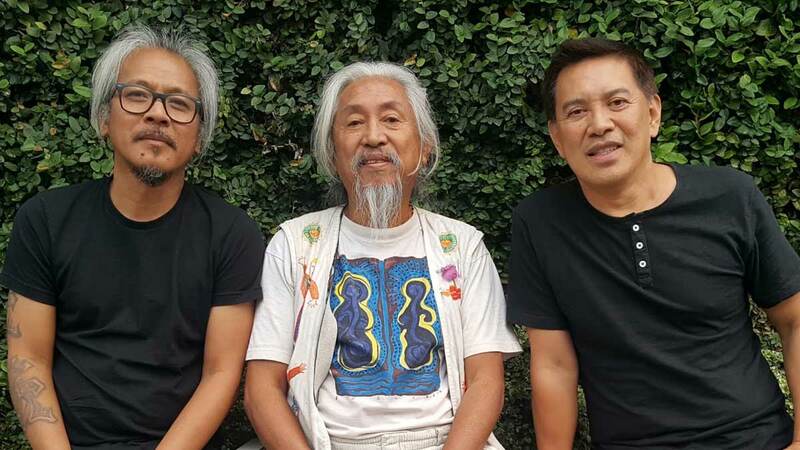 (L-R) Lav Diaz, Kidlat Tahimik, and Brillante Mendoza created an omnibus film titled Lakbayan. Lakbayan is an anthology of films by three of the most respected filmmakers in the Philippines: Lav Diaz, Brillante Mendoza, and Kidlat Tahimik. It was the opening film for the 2019 Sinag Maynila Film Festival. Think about it: three revered filmmakers are on a quest to deliver important messages of social relevance through their work. Their contrasting methods tell three different stories, three different ways—a healthy variety that offers three different experiences to moviegoers. Lav Diaz's entry, Hugaw (Dirt), is the story of three miners who embark on a risky journey that takes them through mountains, the jungle, and across the sea. It stars Nanding Josef, Bart Guingona, and Don Melvin Boongaling. Brillante Mendoza's entry, Desfocado (Defocused), tells the story of an out-of-a-job videographer (Joem Bascon) who chances upon the Sumilao farmers—a group of 55 farmers who walked 1,700 kilometers from Sumilao, Bukidnon to Manila—protesting for their rights to reclaim their ancestral land. He decides to follow the farmers around and films them with the hope of selling the footage to a TV station for a lucrative sum. Watching it is akin to watching a documentary. Desfocado stars Soliman Cruz, Fe Ging Ging Hyde, Perry Dizon, Vince Rillon, and Japo Parcero. Kidlat Tahimik's Lakaran ni Kabunyan documents the journey of Tahimik's son, Kabunyan De Guia, from Baguio to Davao. It's a travelogue of sorts that takes viewers to different spots around the Philippines and gives them a peek into the local culture in each destination. It's easy to associate the mustard-colored minivan Kabunyan drove to the one used in the Hollywood film Little Miss Sunshine. Aside from the concept of traveling from one place to another, there is a common thread that binds the three stories together regardless of their differences in execution: oppression. The message is clear—we need to fight against oppression. It could be oppression against miners, against farmers, against artists, and even clowns. Hugaw receives treatment similar to what we’ve seen in Lav Diaz's previous work. It's a black-and-white film, and there's very little to look forward to, visually. The essence of the narrative is dependent on the dialogue which is not necessarily a bad thing, even if not much is going on. Except for a scene or two, there's very little about this film that will stay etched in memory. One, in particular, is the scene where two of the main characters tell the story of how they were maltreated while they were still working as clowns. If you have zero knowledge of the Sumilao farmers, it would be a good idea to research in advance before watching Desfocado to get some context. Because majority of the scenes are presented to mimic raw footage, it takes a while for the scenes to gel together and form a story, unless you are already knowledgeable regarding the historic march of farmers that happened in 2007. As cheerful and informative Lakaran ni Kabunyan is, it also feels somewhat detached from the audience. Unless you're an artist like the people De Guia met along the way or struggling in your locality, it will be hard for you to feel empathy towards this film. The conversation is one-way; it does tell a fun and engaging travel story, is easy on the eyes, but it barely connects to the viewer on a personal level or tugs at one's heartstrings. Lakbayan walks viewers through the different journeys that we, as Filipinos, make: the journey of everyday survival, the journey of self-discovery, finding the road that leads to redemption and justice, and simply traveling from point A to B on a map, to name a few. With different stories and different ways of telling them, Lakbayan allows us to feel a myriad of emotions, and pain in varying degrees. Desfocado delivers the heaviest drama as it enacts the plight of the farmers, and it becomes particularly emotional when Joem Bascon's character realizes that something he used to see as a mere opportunity to earn income has become his own personal battle, too. It's a scene that makes you feel like something is lodged in your throat and you're so close to tearing up. There is no trace of real-life Joem Bascon or the characters he has portrayed in the past. In this film, he is just your average ordinary guy with a conscience and a heart, but who can also make you cry. Despite the somber mood created by the first two films in this trilogy, Lakbayan nonetheless ends on a cheerful note—and with a hopeful message. In Kidlat Tahimik's film, his son encourages us to seek happiness from within, which he refers to as "liwanag sa loob mo." You can still catch films at the 2019 Sinag Maynila Film Festival in select SM Cinemas until April 17.